A Novel BONUS - Includes Download a FREE Audio Books Inside (Classic Book Collection) The Odyssey is one of the two major ancient Greek epic poems (the other being the Iliad), attributed to the poet Homer. The poem is commonly dated to between 800 and 600 BC. The poem is, in part, a sequel to the Iliad, and concerns the events that befall the Greek hero Odysseus in his long journey back to his native land Ithaca after the fall of Troy. It takes Odysseus ten years to return to his native land of Ithaca after ten years of war; during his 20-year absence, his son Telemachus and his wife Penelope must deal with a group of unruly suitors who have moved into Odysseus' home to compete for Penelope's hand in marriage, since most have assumed that Odysseus has died. The poem is a fundamental text in the Western canon and continues to be read in both Homeric Greek and translations around the world. (Summary from Wikipedia A wandering king who's a war-hero doomed to roam the earth by a vengeful God, a plethora of fantastic experiences, a wife battling the invasion of suitors who wish to replace her missing husband, a son in search of his father - the Odyssey is a rich tapestry of incredible experiences and unforgettable characters. A must-read classic for anyone who wants to understand the fundamentals of Western mythology, it is a sequel to the Illiad which recounts the magnificent saga of the Trojan War. The Odyssey continues on, describing the trials and tribulations of the Greeks under the leadership of Odysseus. Reputed to have been composed nearly three thousand years ago, its authorship is still being debated by scholars, though much of it is attributed to the blind poet Homer about whom very little is known. Yet the Illiad and The Odyssey remain the definitive foundations of all Western literature. 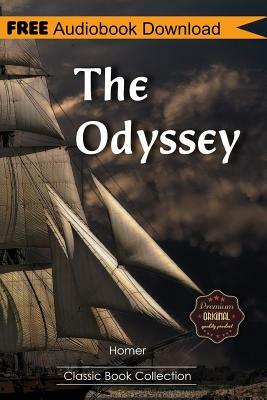 The Odyssey is a magnificent epic tale that portrays the journey called life. In fact the word "odyssey" in English itself has come to mean a long and eventful journey. In the preceding book The Illiad, Odysseus called Ulysses in Roman mythology, the king of Ithaca, gets embroiled in the Trojan War through the trickery of the Greeks. But once inside, his wonderful qualities of intellect, strategy and leadership come to the foreground as he leads his soldiers to victory. The story of the Odyssey begins when the war of The Illiad ends. Odysseus and his men embark to return to Ithaca but his sworn enemy, the sea god Poseidon, stymies him at every turn, sending storms and foul weather, forcing the wanderers to take shelter in strange and sinister lands. The Odyssey is, besides, the story of Odysseus' beautiful wife Penelope, whose life becomes a struggle, fighting off the innumerable hopefuls who wish to take over her kingdom and her fortune in the absence of her husband. It is also the poignant growing-up tale of Telemachus, a faithful and steadfast son, who refuses to believe that his father won't return. There are many notable translations from the original Greek and it has also been extensively portrayed in art, literature, television and television in languages around the world. Full of human tragedy, bizarre and fantastic creatures, gods and magical beasts, the Odyssey is a treasure-chest of marvelous events. For modern-day readers, young and old alike, it provides exciting, interesting and relevant ideas of war, politics, exile and identity. Audiobooks Made Easy. - Enjoy books in a whole new way. Great narrators make a story come alive. - Be more productive. Transform you commute, workout or chores into listening time. - Listen anytime, anywhere. Listen on your ipod, laptop, smartphone or tablet. Listen in your car, on a run, in the office, in the gym... BONUS - Included Exclusive Collection of FREE Audio Books Downloads in MP3 Format Inside. You get all these Bonuses just for taking action today..... It's our way of saying "thanking you" Click the "Add to Cart" button to start your reading journey RISK FREE. Where He Was Born Once again, the exact location of Homer's birth cannot be pinpointed, although that doesn't stop scholars from trying. It has been identified as Ionia, Smyrna or, at any rate, on the coast of Asia Minor or the island of Chios. But seven cities lay claim to Homer as their native son. There is some basis for some of these claims, however. The dialect that The Iliad and The Odyssey are written in is considered Asiatic Greek, specifically Ionic. That fact, paired with frequent mentions of local phenomena such as strong winds blowing from the northwest from the direction of Thrace, suggests, scholars feel, a familiarity with that region that could only mean Homer came from there. The dialect helps narrow down his lifespan by coinciding it with the development and usage of language in general, but The Iliad and The Odyssey were so popular that this particular dialect became the norm for much of Greek literature going forward. The Iliad and The Odyssey Homer's two epic poems have become archetypal road maps in world mythology. The stories provide an important insight into early human society, and illustrate, in some aspects, how little has changed. Even if The Iliad itself seems unfamiliar, the story of the siege of Troy, the Trojan War and Paris' kidnapping of Helen, the world's most beautiful woman, are all familiar characters or scenarios. Some scholars insist that Homer was personally familiar with the plain of Troy, due to the geographical accuracy in the poem. The Odyssey picks up after the fall of Troy. Further controversy about authorship springs from the differing styles of the two long narrative poems, indicating they were composed a century apart, while other historians claim only decades -the more formal structure of The Iliad is attributed to a poet at the height of his powers, whereas the more colloquial, novelistic approach in The Odyssey is attributed to an elderly Homer. Homer enriched his descriptive story with liberal use of simile and metaphor, which has inspired a long path of writers behind him. His structuring device was to start in the middle-in medias res- and then fill in the missing information via remembrances. The two narrative poems pop up throughout modern literature: Homer's The Odyssey has parallels in James Joyce's Ulysses, and his tale of Achilles in The Iliad is echoed in J.R.R. Tolkein's The Fall of Gondolin. Even the Coen Brothers' film O Brother, Where Art Thou? makes use of The Odyssey.